August 16, 2016 - New York, NY: We mark the anniversary of the World Labor Athletic Carnival, held on August 15th and 16th at New York’s Randall’s Island, to protest the holding of the 1936 Olympics in Nazi Germany. The two day event, organized by the Jewish Labor Committee with the active support and cooperation of a number of unions and labor bodies, brought over 400 athletes from across the country to compete in what became known as the “Counter-Olympics.” Honorary co-chairs of the event included New York Governor Herbert Lehman, NYC Mayor Fiorello LaGuardia, American Federation of Labor President William Green and Judge Jeremiah Mahoney, former President of the Amateur Athletics Union of the United States and a leader of the “Move the Olympics” movement, who resigned from the American Olympic Committee to protest holding of the 1936 Olympics in Berlin. Chairing the Labor Committee of the Carnival was Isidore Nagler, Vice President of the International Ladies’ Garment Workers’ Union. The story of this episode in labor history begins in late 1934, when the newly-formed Jewish Labor Committee (JLC) learned about plans to hold the 1936 in Berlin. Early in 1935, JLC Chairman Baruch Charney (B.C.) Vladeck was invited to join the “Move the Olympics Committee” headed by Samuel K. Maccabee. Soon thereafter, JLC Executive Secretary Isaiah Minkoff and Vladeck began work on organizing a massive anti-Nazi demonstration to take place while the Olympics were taking place in Berlin. The JLC decided to organize a”counter Olympics” in New York City. 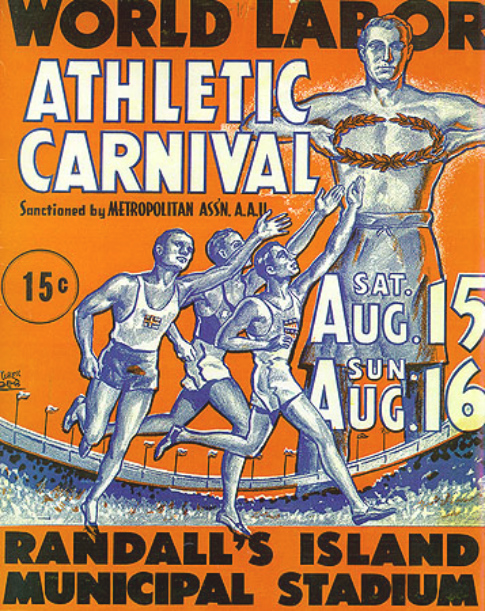 The public event, held over the August 15th – 16th weekend at the newly-opened Municipal Stadium on Randall’s Island, brought together hundreds of athletes from various sectors in the United States and abroad, and gained the imprimatur of the Amateur Athletic Union, the highest body for such games. This anti-Nazi protest was widely covered in the general, labor and Jewish press of the time. The event was so successful that another one was held the following year. Although the latter of course had less direct connection with the anti-Berlin Olympics protests of 1936, it nevertheless gave an opportunity during the summer of 1937 to publicly protest the Nazis and their activities. The World Labor Athletic Carnival was a unique publicity vehicle to support those in New York and around the world who actively opposed holding the Olympics in Berlin and thereby giving prestige and legitimacy to Hitler and his regime. At the same time, it gave visibility to the Jewish Labor Committee and other groups and individuals active in the anti-Nazi struggle. You can read more about it in this news article.